It was too good a pun to pass up…This week we installed our wood countertops. It went very smoothly. The cut outs for both the induction cooktop and the undermount sink went very well. We deliberated for some time as to how to cut out for the sink as the undermounting of it meant that any mistakes would be highly visible (read: unacceptable). We considered using a router but in the end used the Festool plunge cut track saw (an expensive but totally useful, incredible tool) for the long cuts on all four sides and then a Makita jigsaw to finish the rounded corners. The Festool orbital sander took care of anything that needed smoothing and overall, it was an easy process and looks lovely. The undermount sink is made by Zuhnë, a company I recommend checking out if you are looking for high quality, stainless steel sinks. They offer undermount, traditional, and farmhouse sinks. They also offer faucets. All are beautifully made, come with lifetime warranties and are packed with incredible care. All needed parts are included for installation. Customer service is amazing, any questions you might have and they will do their best to help almost immediately. After the countertops and sink were installed, we connected the dishwasher and got the cooktop wired in. After that, it was merely to oil the countertops and enjoy cooking in a new space. No more dishes in the bathtub! From the kitchen we moved out to the stairwell and this week installed the treads and risers. I sanded them today and we finished installing the last bit of flooring in the house which was at the top landing of the stairs. Natural pine treads & risers, ready to be varnished. Newel posts & hand rails this week. Our last major accomplishment for the week was to take the garage full of cardboard recycling and disturbing amount of styrofoam packing boards to the transfer station. While it sounds a small thing, it was actually a huge delight to see that the garage is now open again and a regained work space. The unfolding week will have us build newel posts for the stairs and then install the handrail. I plan to finish all the floor varnishing this week - the stairwell, master bedroom and second floor hallway are all that remain to be done. It’s possible that we’ll also get shelving installed in the built in bookcases this week, but the stairs remain primary. This week’s work has brought a lot of enjoyment and seemed to come together with great ease…an unlooked for treat! This past week we’ve worked primarily in the kitchen, building the plywood substructure of the cabinetry. What a difference it makes to see an empty room, that could really be any room, develop a shape that is unmistakably "kitchen". It’s pleasing to see the skeleton of its future become apparent. Shawn used ¾” urea formaldehyde-free ACX plywood and together we cut the pieces down using both a track saw and a table saw and then used pocket hole joinery to put them together using a Kreg jig. Once in place, they could be affixed to the walls and floor. The lower cabinets went together easily and the upper cabinets were not difficult to install, as the plywood keeps things so square. Yesterday’s coup was to install the oven in place, looks beautiful and works! The range hood is also installed. Now it’s time to put on the counter tops so that the sink can be placed (looking forward to this immensely as it means goodbye to dishes in the bathtub!) as well as the cooktop. So later this week we should be able to use a genuinely semi-finished kitchen. It will be fun after moving about the downstairs room with my portable kitchen (which actually works beautifully despite being an assortment of mini appliances sitting atop plywood over sawhorses). I took some of the good warm days this week to lay down a cover layer of ⅝” crushed rock from a nearby quarry on the backfill around the house. We used cleaned construction rubble as the fill for our stone retaining wall (a huge savings over gravel) which was highly effective but grating to look at after many months. The crushed rock is a beautiful blue black and settles to a smooth, packed but permeable surface that soothes the eye and is wonderfully free of little exposed chunks of brick and concrete and stones. I’ve a bit more work to do with the gravel, but 12 yards out of 15 are settled in their new homes. Somehow it’s a bit sad to be coming to the end of the enormous gravel pile (although our ancient wheelbarrow may disagree with my sentiments). 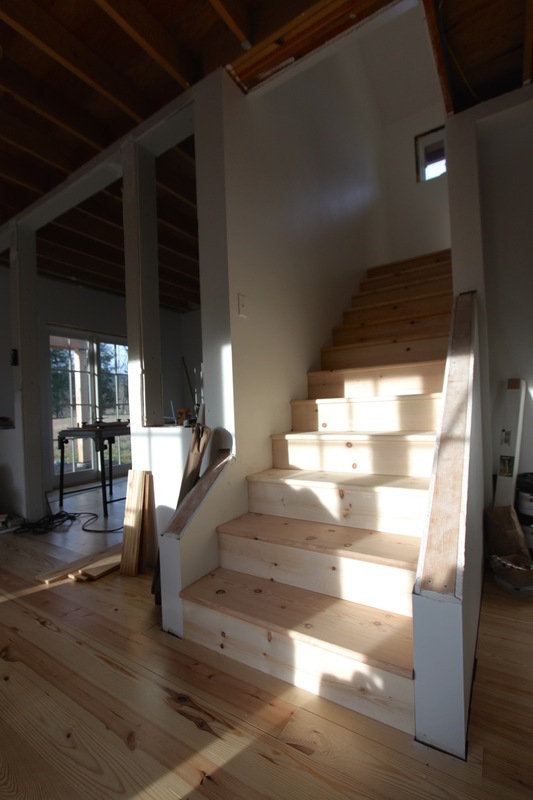 Once the basics of the kitchen are up and running, it will be time for Shawn to shift gears and finish the stairs (we’ll be installing permanent stair treads and risers this week) and think about installing the main floor ceiling, which will be tongue in groove pine. Then will be casings for windows and doors (we are in the process of ordering doors) and trim moulding. Shawn decided that he wanted to focus all of his attentions on the cabinetry (which he enjoys building) without a lot of small projects knocking on his door.